I recently flew from the US to Australia and back. I do this every year so I know something about self-compassionate air travel and nurtured jet lag. Taking the time to address as many of my comfort needs as possible before, during and after a flight is one of my most important self-compassion practices. Drink plenty of water. Dehydration affects the body’s ability to maintain health, especially when the viruses of those dozen sick people in the plane are trying their hardest to latch onto you. Make sure you are good and hydrated before you get on a plane, which means drinking at least 2-3 litres of water per day and eating lots of fruits and vegetables in the days leading up to your flight. Don’t be afraid to snort nose moisturizer, lather on lip balm and douse your eyes with eye drops. At around 12% humidity airplanes are much dryer than the recommended healthy humidity level (40-60%). Get up and exercise every hour. Deep vein thrombosis (DVT) is potentially lethal – the blood slows down in your extremities, has the potential to clot, then pushes that clot up to your vital organs where it can do all sorts of damage. Staying hydrated helps to prevent DVT. Take something to help you sleep on overnight flights. The flight plan will include lights out sleeping time, to encourage your body to adapt to the new time zone you are flying into, and your body might not be ready to sleep at this time. Trust me, it’s best to coerce it into slumber, to avoid the hangover later. There are a number of natural sleep aids that you can experiment with. Speaking of hangovers, don’t take advantage of the free alcohol on the flight unless you also plan on drinking a similar quantity of water. Drinking alcohol leads to dehydration and is also a risk factor for DVT. Take some anti-nausea pills if you are prone to travel sickness, especially around takeoff and landing. The little bag they give you, just in case, doesn’t look fit for the job, so you don’t want to test it. One of the positive side effects of some anti-nausea medication is that it makes you drowsy, helping you to sleep. Wear earplugs, an eye mask, one of those horseshoe shaped neck pillows and a pillow behind your lower back if you are prone to back pain. These things will make it so much easier to nod off. Personally, I love listening to binaural beats with nature sounds on noise-canceling earbuds (which double as earplugs) – even if I don’t completely fall asleep, at least I get into a very relaxed, half-conscious state. Wear comfortable clothes you can layer. You never know if someone might ask the pilot to adjust the cabin temperature to one that doesn’t suit you. Boost your immune system with vitamin C, or an immune supplement before, during and after your flight. If you have any sort of nasal congestion, take something to alleviate the pressure. I once sat on three planes in succession for 24 hours, feeling like my head was going to explode because I couldn’t relieve the pressure in my sinuses – it took me two weeks to recover. All that fluctuation in cabin pressure will magnify any sinus problems you already have. Please learn from my pain. 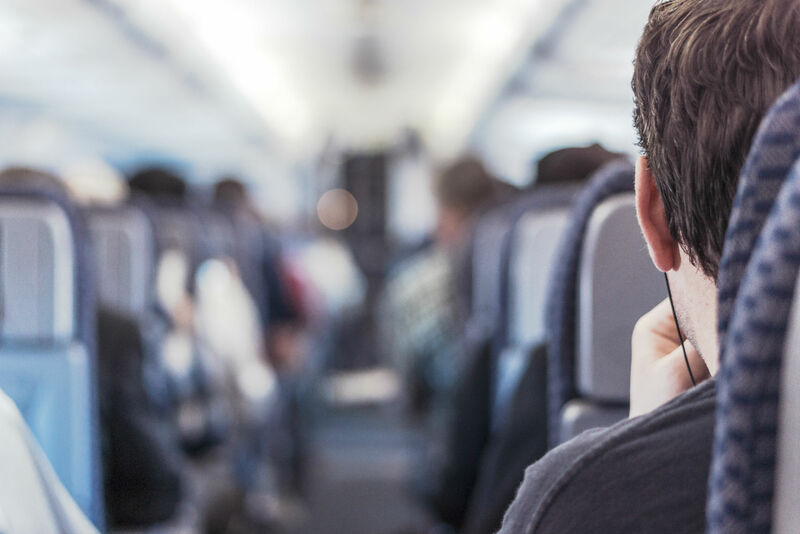 In addition to this, if you can, get a seat with extra legroom, a seat next to a vacant neighbor seat, or upgrade your cabin. These options won’t always be available, but on a 14-hour flight, they can make a whole lot of difference. You might even get higher air quality if you upgrade. Being cut off from the Internet can actually be a sweet reprieve from the constant pull toward emails. Also, boredom can be unbearable in a confined space, so take along books, your iPod, your laptop, anything small that will keep you occupied for hours. Some planes have in-flight movies, but you can’t always rely on these to keep you going for an extended period of time. Some have Wi-Fi, but you can’t always rely on that working, so some non-connected entertainment is the way to go. Being cut off from the Internet can actually be a sweet reprieve from the constant pull toward emails. Finally, be kind to yourself either side of a long flight. I’ve taken to traveling just one leg of a transcontinental flight per day, opting to stay at a hotel near the airport in between legs. Being introverted, this helps me to re-energize in between bouts of intense socialization, and it also gives me an opportunity to exercise my body, re-hydrate, and get some good sleep! You’re welcome, my dear! Lovely to see you here. Hello dear Ruth. Thanks so much for commenting. I know that you are very conscious of taking care of yourself during travel. I’ll use your great suggestions in another HeartWorks post soon! Until then, safe travels!